Getting the right cut for the right fabric is the key to good design. One of the most challenging aspects of a fashion designer’s training is learning how to crate patterns that utilize the characteristics of fabrics. With an ever expanding range available, an understanding of the relationship between fabric, form and pattern shape is now the most important skill a designer has to acquire. Winifred Aldrich, a leading pattern cutting authority, explores how a garment’s shape is created and discusses the factors that need to be considered when creating patterns and offers you a practical method for solving problems. No other pattern cutting book considers the effects of individual fabrics and its approach is based on the appraisal of the fabric and body shape. Fabrics and Patterns Cutting is the revised and simplified edition of Fabric, Form and Flat Pattern Cutting. It is fully illustrated and makes use of numerous practical examples. It also takes into account important new developments in fabric – new fabrics, new methods of fabric construction and new fabric finishes. Free block patterns are available online for readers to print out for use in their classes. 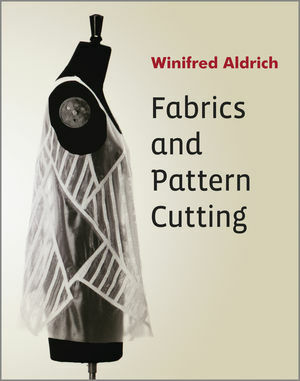 Winifred Aldrich is a world authority on pattern cutting and author of six fashion titles. Winifred was formerly Professor of Clothing Technology at Nottingham Trent University and a practicing designer. She continues her research into pattern design practices. The blocks are stored as PDF files that are named by the titles in the book, plus the size code.